The 133-year tradition that is the phone book (a.k.a., the White Pages) is quietly coming to an end. According to the Associated Press, New York, Florida and Pennsylvania have all obtained approval this month to stop printing the paper-based phone book. Virginia residents have until November 19th to provide comments on a similar request. The statistics are rather stark: only 11% of of households relied on the white pages in 2008 (down from 25% in 2005). Land line phones are being disconnected at a rate of 10% per year, as people make their cellphone, which is not listed in the white pages, their only phone. And in places where the phone companies have been allowed to offer a choice, only 2% of customers have asked for a phone book. Technology is obviously the “killer app” here. Phone numbers are much more easily obtained via search engines, which are often available on the smart phones themselves. The smart phones also have Caller ID and electronic address books, so frequently (or even infrequently) called numbers are recorded and stored for later use, gradually creating a personalized phone book for each person. And for those Neanderthals who don’t have smart phones, the phone company can print a single, on-demand phone book just for that person, or even send them a CD-ROM. All of this, of course, leads to big cost savings for the phone company, who doesn’t have to print the (largely advertising-free) book. And, of course, there are environmental benefits as well – each book represents just over 3.5 pounds of paper. So it seems like a win-win situation all around. The only thing left, as far as I can tell, is for Google to invent a way to prop up the leg of a wobbly table. Also, when handling swords, stay away from the pointy end. So what’s more unbelievable than this? How about a sternly worded cease and desist letter from LucasFilms? Apparently, despite the fact that the company never used the term “light saber” and goes out of their way to warn people how dangerous the product is on their website (my favorite line: “the Spyder III Pro Arctic . 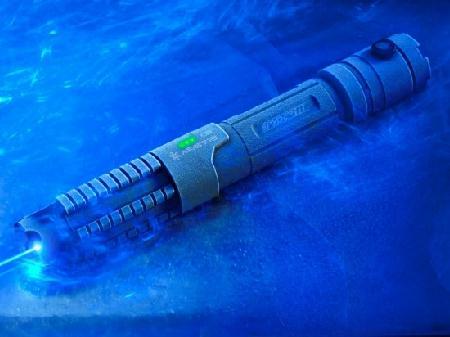 . . is not a toy, it is a high power Class 4 1W laser. . . . this laser must NEVER be used to play with your pets.”), LucasFilms still feels it has the right to make them stop selling it. Hollywood “Faces Off” with Reality and Wins…again! The patient now has a completely new face from his hairline down and only one visible scar, which looks like a wrinkle running across his neck, said Dr. Joan Pere Barret, the surgeon who led the team. “If you look him in the face, you see a normal person, like anyone else we have as a patient in the hospital,” Barret told The Associated Press on Friday. He declined to name the patient or give details of the accident five years ago in which he lost his face, saying only that he was a Spaniard between the ages of 20 and 40 and is recovering well. He cannot yet speak, eat or smile, but can see and swallow saliva. So here’s my question: now that he has a new face, does he look more like Nicholas Cage or John Travolta? Scientists have unlocked the entire genetic code of two of the most common cancers – skin and lung – a move they say could revolutionise cancer care. Not only will the cancer maps pave the way for blood tests to spot tumours far earlier, they will also yield new drug targets, says the Wellcome Trust team. Scientists around the globe are now working to catalogue all the genes that go wrong in many types of human cancer. The UK is looking at breast cancer, Japan at liver and India at mouth. China is studying stomach cancer, and the US is looking at cancers of the brain, ovary and pancreas. Basically, this redefines cancer from a disease to a series of genetic mutations, each of which can be studied, prevented, treated, or cured. Skin cancer (melanoma) is a combination of 30,000 “errors” in the DNA of the cancerous cells which are not present in the healthy cells. Lung cancer is a series of 23,000 errors. So now, we not only know that sun exposure causes skin cancer and smoking causes lung cancer, but we know why and how they cause it. The experts estimate a typical smoker acquires one new mutation for every 15 cigarettes they smoke. Although many of these mutations will be harmless, some will trigger cancer. By quitting smoking, people could reduce their cancer risk back down to “normal” with time, he said. The suspicion is lung cells containing mutations are eventually replaced with new ones free of genetic errors. So, if you’re incredibly unlucky (meaning every genetic mutation you cause by smoking contributes to lung cancer), then you’ll have cancerous cells in your lungs after 1,534 cigarettes. Or, at a pack per day, in about 77 days. If only one mutation in ten hits the cancer jackpot, then you’ve got 767 days, or just over two years. After that, you’re counting on your body to produce healthy, “error-free” cells at an equal or faster rate than the cancer cells die. Too many cancer cells, and they’ll survive long enough to multiply faster than the healthy cells, at which point, you’ve got yourself a tumor. Then again, now that we know which genetic defects are at fault, we could invent the medication that prevents the defect (or corrects it, or kills cells that contain it, etc. ), effectively providing the “cigarette antidote.” Think of it – a pill that comes in every pack of cigarettes. When you finish the pack, swallow this. Problem solved. Dial-Up: the sound of a modem connecting to another modem has become relegated to War Games and movies like it. Movie Rental Stores: Say goodbye to your local Blockbuster’s, if you still can, and sign-up for your Netflix account (or just use your TV provider’s On-Demand channel). Also obsolete: late fees. Maps: With GPS devices and Google Maps-enabled phones, why figure out how to fold (and un-fold) a map? Newspaper Classified Ads: Thank you, Craig Newmark. Landline Phones: When your cellphone works anywhere, why have a phone that plugs into your house? I’m not sure this one is gone for good yet, but it’s certainly getting there. Public Pay Phones: This one’s for you, Bennion. Again, when your cellphone works anywhere, why have a phone that plugs into a closet on a street corner? VCR’s: Even DVD’s are going away, now that Blu-Ray has won the day. The VCR has officially gone the way of the Betamax machine. Fax Machines: If anyone’s even sending faxes anymore, they’re winding up in e-mail boxes, not paper trays. Phonebooks, Dictionaries & Encyclopedias: What used to take up shelves, now takes up hard drive space. And now it’s searchable! Also becoming obsolete: the need to remember the order of the letters in the alphabet. Getting Bills in the Mail: or, for that matter, sending checks back to pay them. I honestly don’t know how much a stamp costs these days. Buttons on Electronic Devices: Touchscreens have brought us into the Minority Report world. Paper: It’s true. While everyone’s screaming about saving the environment, we’ve managed to eliminate a great deal of the paper in our lives, and it’s becoming moreso every day…. A pretty good list, I think. Your turn to chime in – what did they leave off the list? 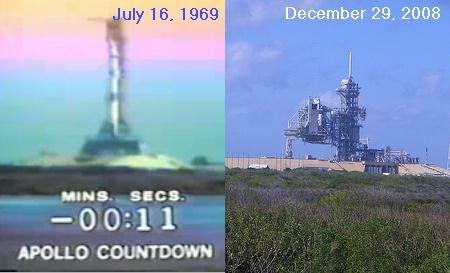 Watching the launch today, I can’t help but marvel at what we accomplished, but also at how positively primitive the technology was at the time. I also marvel at how, now that we have people living and working in outer space for months at a time, a similar launch is nothing more than a brief story on the evening news. My friend Ilya turned me on to a blog called The Speculist, which I glance at periodically. Most of the time, it’s mildly interesting but nothing to blog home about. But this past weekend, it ran four stories that really caught my eye, so I figure I’ll force them upon share them with you. The 55 mice used in the University of South Florida study had been bred to develop symptoms of Alzheimer’s disease. First the researchers used behavioural tests to confirm the mice were exhibiting signs of memory impairment when they were aged 18 to 19 months, the equivalent to humans being about 70. Then they gave half the mice caffeine in their drinking water. The rest were given plain water. The mice were given the equivalent of five 8 oz (227 grams) cups of coffee a day – about 500 milligrams of caffeine. Now how’s that for great news? Next up – the Starbucks Center for Memory Enhancement.